Barbarella (1968) [Durand-Durand a.k.a. The Concierge]: Consumed by the liquid life-form Mathmos when it floods his burning control room. 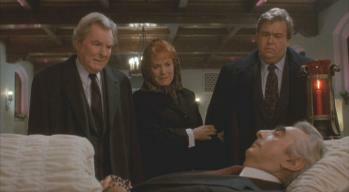 Only the Lonely (1991) [Doyle]: Dies (off-screen) of a heart attack; his body is shown afterwards lying in his coffin as John Candy, Maureen O'Hara, and Bert Remsen attend his wake.